Co-Op Type: Four player online/2 player split. Story based and survival modes. I'm going to go on record right now and say the uproar of the Left 4 Dead 2 announcement is going to be completely silenced once people get their hands on the game on November 17th. While most have deemed the game a "map pack" - there's a lot more going on underneath the surface, and even above it, than previously thought. I got to play then we Dark Carnival Map with a handful of other journalists at PAX this year, and as we made are way from the deserted and car strewn highway all the way to the Tunnel of Love safe house it became abundantly clear - I love killing zombies. What Left 4 Dead 2 adds to the series' already proven formula is a lot of unique twists and turns that help keep it fresh and different. While the AI director in the first game did a good job of randomizing and mixing things up, there was only so much you can do with 8 weapons and a few specials. After a few play through's most solid co-op groups had a strategy down pat, and knew what to expect and how to handle any situation. 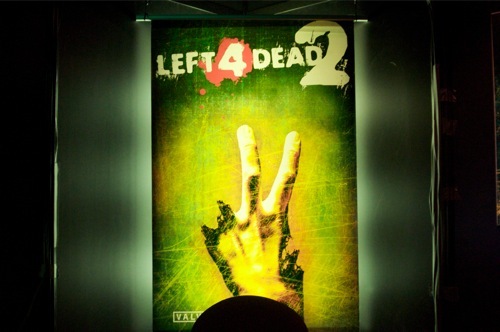 Left 4 Dead 2 looks to change that. There's dozens of new weapons to shoot with like AK-47's, Desert Eagles, and even grenade launchers. There's also the huge addition of melee weapons with things like crowbars, frying pans, katanas and even guitars. The really impressive thing is the new damage and dismemberment model on the zombies which causes their skins to split and bleed, and their limbs to get knocked or chopped off. Seriously, I spent a good 10 minutes running around with the katana chopping off arms and heads of zombies and laughing maniacally to myself. Just when I thought it couldn't get any better than that, I found a guitar, and like a home run slugger in baseball proceeded to bash the heads off zombies. Besides the weapons, Valve has thrown in a few new special zombies that really change the dynamic of the game. The Charger is like a mini Tank that will run and grab a survivor, and then carry him away from the group. The Jockey is similar in that he'll hop on your back and start to steer you away from everyone. So while they are similar to the Smoker in that they try to break up your group, it's the quickness in which they accomplish that which adds to the chaos and tension. Our group also ran into another special called a Spitter which spits acid and is really deadly when attempting to take him down in close combat. The Dark Carnival Level is definitely not one for those of you with a fear of clowns. The clowns in Left 4 Dead 2 are not only undead - they have squeaky shoes. I'm not talking about sneakers on a basketball court squeaky, I'm talking about dog toy squeak-squeak. As you know zombies are attracted to noise, so any clowns you see tend to have a pack of mindless zombies lumbering close behind. The freakiest moment I witnessed was one a teammate lopped the arm off a clown zombie. It slumped against the wall and looked to be dead. Suddenly it arose and squeaked towards my teammate. A quick strike sent its head flying, but not before the image of it rising from the dead was permanently burned into my brain; most likely giving me nightmares for weeks. I saw both the PC and 360 version of the game, and both looked improved in terms of graphical fidelity. Everything just appeared crisper. Left 4 Dead 2 is also a lot more violent than the original, thanks in part to the dismemberment system and the new blood effects. Make sure you give the pipe bomb a try now, flying zombie chunks FTW. Yup, I like killing zombies. Page created in 0.2335 seconds.